This past few days I have been home with my son Zak whilst my wife is away camping for the long weekend. Last year I took him to Seaton on a really long day out, this year he wanted to go to Paignton - and maybe Exeter as well. Mid morning we are waiting at Bretonside and we have a real choice of transport. The X80 was a smart East Lancs 55 reg Trident, next to it was the Stagecoach Trident X45 and then came the X38, which was one of the trusty Volvo Interurban Plaxton coaches which have served this route for years. We decided to go to Exeter first so we paid our £6 for the Explorer and made our way to the back seats. The last time I caught one of these the air vent wasnt working and it was incredibly hot. On this coach the vent was working really well, so much that Zak asked me to turn mine off. He was happy once I had pointed it away from him. These are comfortable coaches - but dull and dark inside. One problem Zak has with these is that he can only just see out of the window so wasnt overly happy on this coach. The journey was nice and smooth and no delays so it did go quite quicky so soon we were in Exeter. I have never worked out where the nearest cash machine to the bus station is so we headed down into the City Centre to get some money - and while we were there we lunched in Burger King. There does seem a lot on construction going on in Exeter at the moment but the buses seemed to be moving easily enough. Back to the bus station and Zak was happy to see a Trident come in for the X46. I was dissapointed not to get one of the Megabus Olympians. Zak was even happier when he got his front seat! At least we got the nearside seat as the offside above the driver has extremely limited leg room on these buses. I have never really liked Alexander bodies with all their blue plastic which reminds me of a 1970s bathroom suite. These buses do give a good ride, have good speed and provided a good journey to Torquay. Sadly the days of front opening windows seems to have gone for good. Not too bad while the bus was at speed but boiling while sat in traffic - something the Torquay bound buses do a lot. Stop for an ice cream in Torquay and the choice of buses to get to Paignton. Sadly Zak insisted on a 12 as he didnt want to go on an open topper. The X80 open toppers were doing reasonable business on this lovely hot day, but the one Stagecoach open topper I saw was full upstairs so they dont seem to be loosing much business. We did finally get to see a Megabus Olympian on the X46 going back to Exeter. Another Trident soon turned up on the 12 and a slow run to Paignton in heavy traffic. Paignton Bus Station seemed to full of Tridents - almost all of them on variations of the 12! Zak asked why all the buses were number 12's. I didnt notice the world famous number 12 driver while I was there, although he was working. After a trip around the train stations for Zak and a long walk to try and find toilets (not easy) we made our way back to the bus station. the 16:40 X45 back home. Standard Trident only this time we couldnt get the front seat. Zak was not happy. Even worse was that on this journey we were blessed with the family from hell. foul mouthed couple with 5 kids - all equally foul mouthed and loud. It seemed a very long time before we reached Marsh Mills where we could get off for a spot of peace and quiet. I am a commited bus passenger and dont like travelling by car unless I have to. Journies like this one made me wish I could have driven. After a spot of shopping at Sainsburys we found we had a fifty minute wait for a Citybus 50. Zak was brilliant for this long wait so we played several car counting games - the time soon passed. Sadly the Citybus journey home was just as bad as we have five very drunk lads behind us - even more foul mouthed than the other lot. Apparently they had already been kicked off one bus. I am amazed they were allowed on this one. I think they were pretty suprised too. All in all it was a good day out for Zak - he enjoyed it a lot more than I did! 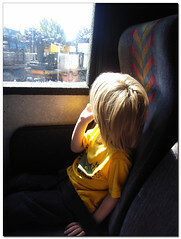 I think he was oblivious to all the bad language going on as he just loves travelling on buses. I know its not the bus companies fault but you can see why people prefer their cars. £6 for a day out like this was good value and the fast direct service on the X45 should make this a good alternative to the car. 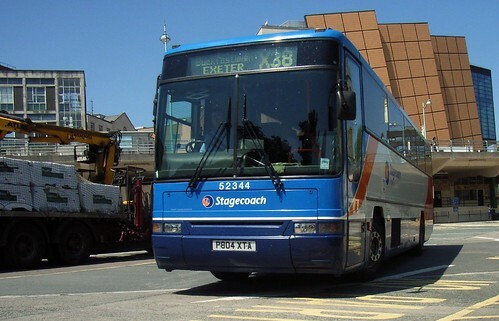 I must admit that I am a 'Western National' man at heart and would have preferred to go on the X80 - if it wasnt for the fact that the Explorer for £6 does open up the rest of Devon on Stagecoach. Sadly with First once you get to Torbay you can really only catch the same bus back again. With the new X45 opening up the chance to use the Explorer ticket from Plymouth to Paington it does open up a lot more options for travel. 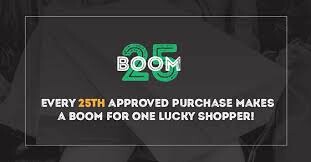 by paying a little extra * you can also use it on Western Greyhound so trips into Cornwall open up too. Sadly the options for using the First equivilent day ticket are rather more limited. Stagecoach do seem to be coming out on top of this current skirmish, the X45 is more direct and quicker from Plymouth to Paignton and this is being noticed by passengers at Bretonside when deciding which to catch. It may be a bit of a pain having to change buses at Paignton for Torquay - but they are so frequent its not really a problem. Both the X45 and the X80 seemed to be carrying reasonable loads between Plymouth and Paignton but in previous years the X80 was often carrying full loads and occasionally had to be duplicated. 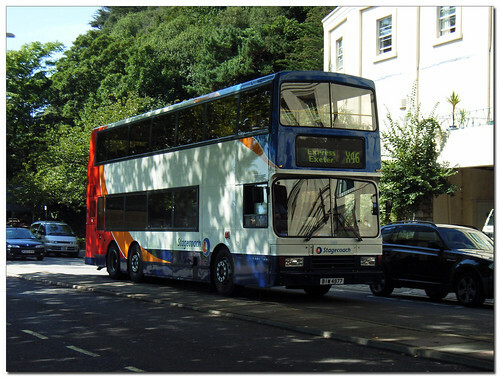 A quick note to end - This is my 700th post to Plymothian Transit! Thanks to all regular visitors as I notice I have just passed the 29,000 visit too. * I can now clarify that the basic £6 Explorer includes travel on Western Greyhound so its an even better bargain than I gave credit for! The extra Explorer Plus Ticket at £7.25 is for use on Plymouth Citybus services as well as Stagecoach and Western Greyhound. I'm beginning to suspect that there is only one working Megabus on the X46 - 13601 (BIW 4977)it seems to be the only one which gets photographed at the moment! I should also have said that the X38 and the X46 are going down to every 90 minutes frequency from the end of September which may make it a little more challenging when planning days out. Dave is very hard to track down - he has offered to email his running board next time I'm up that way!